The quickest way to arrive in the Ukraine is certainly by aeroplane and land in 99% of cases, at Boryspil international airport. Flights are daily with the largest companies, there are more flights for cheaper prices, others direct to and from Italy at prices slightly superior. You will find Boryspil airport about 40 km from the capital Kiev and is connected to the city with numerous means of transport such as buses, coaches, taxis and private taxis of which we will talk about later. The road that takes you to the city is new, smooth flowing with 4 lanes for every sense of speed. One can enjoy the delights of landing at the airport: if it is good weather you can see the capital Kiev from the aircraft windows. In winter with serene skies you can see the great Dnipro river completely iced over, in summer the river is always completely navigable and rich of fluvial traffic. It is certainly an emotion experience to arrive in this land full of magic and rich in tradition. After you land, you berth at the very modern and functional terminal where you arrive at passport control. In general there is not a lot of waiting, for citizens of the European Community it is not necessary for a visa bit it is necessary to complete the immigration card given on the flight and present it together with your passport. This will be stamped and you will be given one half of this, it is very important, it must be conserved and presented at passport control when you leave the Ukraine (see Immigration Card and completion). Past the first control you go into a large lounge where you can eventually take your luggage and if necessary you must complete the customs declaration. This is a necessity when you have contents valued at more than 1000 Euros or valuable objects for declaration. In my modest experience, I have seen that the compilation does not take more than 10 minutes. It's good to report electronic apparatus, such as personal computer or digital and video cameras with a value declaration also if inferior to the consented quota. These declarations are written in many languages including Italian. You can then choose the customs control gate, green if you have nothing to declare and red for valuables or equipment or goods to enter in the Ukraine. Everything is very easy, personnel are very qualified and there are absolutely no problems. At customs all speak perfect English and also it isn't rare to find that they more or less speak other languages, without creating useless problems. The Ukraine is a democratic country that respects the respectful tourist of their laws. A valid passport with at least three months to the expiry date. Visa: the Minister of the Ukrainian Overseas Office has made known that all citizens of the European Union are free from the entry visa obligation for brief stays and in each case no more than 90 days. You can freely import into the country the sum of 1,000 Euros and with a bank declaration up to 5.000 Euros. It is prohibited to export from the country objects of art or antiques dated before 1945. It is necessary to declare at customs upon arrival, possession of a mobile phone. CB equipment can be imported in to the Ukraine, but it is necessary to have authority for their use on Ukrainian soil. The equipment must be declared on the customs module. The possession of drugs is punishable with variable penalties according to the cases, up to a maximum of 15 years in seclusion. Cats and dogs like other animals including fish must be accompanied by a certificate of good health issued by an official veterinary or an authorised organisation, to a maximum of 10 days before arriving in the Ukraine. Cats and dogs less than 3 months old can not be imported. The importation of birds is forbidden for those types that cause avian flu. Past customs you enter a corridor which leads you to the passenger area of the airport, as soon as the doors open you will see a sea of people that, rarely safe in isolated cases, are no-one else but private taxi drivers. The tourist is for them a source of earnings and work therefore don't worry about their insistence and look to keep a positive attitude like the classic traveller who arrives in Kiev for the umpteenth time. My advice is cross this sea of taxi-drivers then, with calm, value the situation and options. I would like to open a small discretion on this. In general they are all good people looking to make a living, with a shuttle service between Boryspil and the city of which, as I have already mentioned, is a distance of about 40 km from the airport. I prefer to advise that for the first time it is better to rely upon an official taxi company taxi that have prices quite economical and are normally, professional. It is not to despise the private service but it is good to know a little so not to run into inconveniences. With my long roaming in the Ukraine, I had by this time a discreet knowledge of taxi drivers and can affirm in all security and by personal experience that the private drivers are neither very efficient but can resolve any situation. The cost to travel to the city is about 100-120 grivne which corresponds to about 20 Euros but figures are unfortunately subject to increased variations because of the serious economic situation due to the increase in petrol prices in a dizzy manner day by day. Other means to reach the city or hotel are by coaches and buses. The cost of these are about 10-15 grivne (2-3 Euros) and don't worry about the state of them, in general they are old and noisy, known to take you to your destination at a really low price. Travelling time depends upon time of arrival in Kiev. There are times when the roads are heavy with traffic as in any other city. 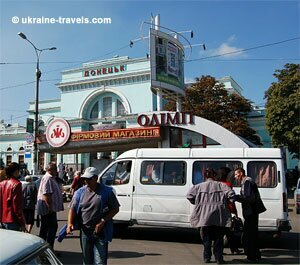 By taxi about 30-40 minutes from Boryspil to Maidan Nezalezhnosti (central square of Kiev), by bus or coach about 1 hour and in general arrive at the train station. I would like to remind you that the capital has an optimal underground network, with carriages a bit dated, but really efficient. The cost of the ticket was 1/2 grivnia, I believe that now with various increases it's not more than 1 grivnia. The Metrò stop is near the train station. I don't believe that there is much more to say, at this point you are in the Ukraine a land really unique, rich with charm and tradition. If you stop in Kiev you will find a city very similar to a European city, if you are not stopping in the capital there are many pages of diverse destinations. 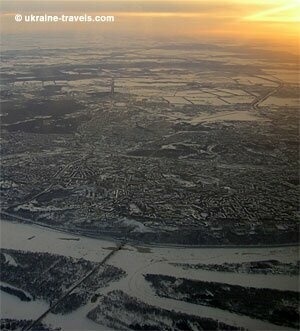 Leave by plane from terminal A of "Boryspil International Airport" or from the second "Zhuliany Municipal Airport".